Laundry is never-ending it seems like. I do a little bit each day instead of all at once. It’s never the same day mostly because I tend to forget to do it. Ok, I stare at it and talk myself out of doing the laundry that day. So a schedule does not work for me. It drives me nuts to see clothes not hung up. The average American family does 8-10 loads every week. (http://laundry.about.com) I can believe that one. What’s up with cats loving to crawl behind the machines? They are always knocking the dryer vent off. Possible ideas: I love this color! If you look at the shelves that is something we will need to do to block access for the cats. Might have to make it where they can easily come apart for cleaning back behind, etc. Here is another shelf idea but would have to lower it and make it the width of the space from the wall to the machines. There is a good gap so the shelf would be plenty wide. Hubby didn’t push the machines clear back because it was very tight getting them in there. A shelf should work. 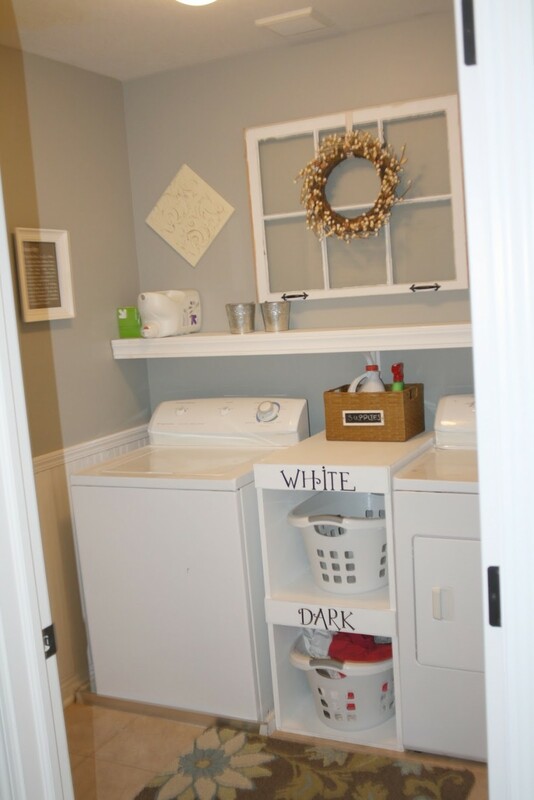 This entry was posted in Oh This or That and tagged color, dryer, hubby, laundry, list, remodel, shelves, washer, Writing. Bookmark the permalink. 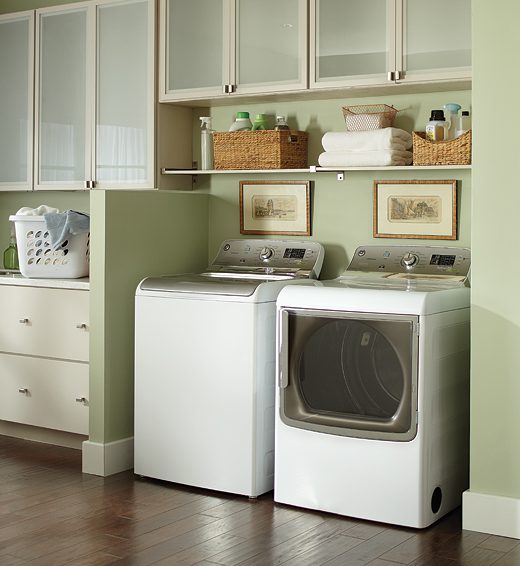 We just had our laundry room redone and it makes doing the laundry so much nicer! It used to be in the unfinished basement – super horrible and dirty. 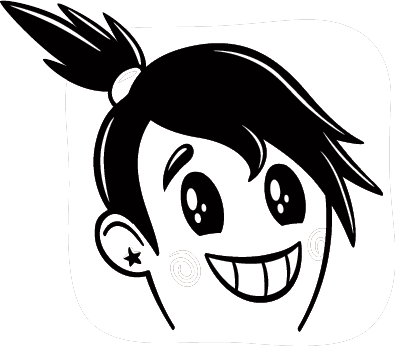 Now everything is clean and orderly…. well, except for that ever-growing pile of clothes that need to be ironed…. 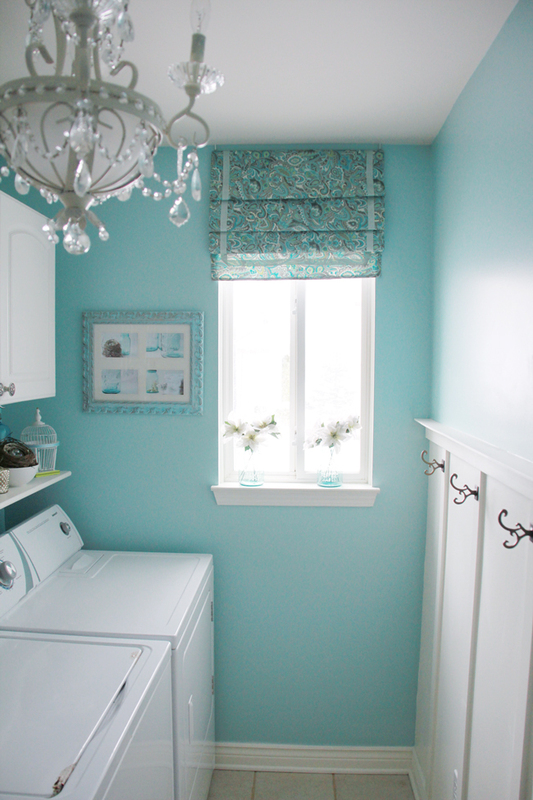 (by the way, I love the light blue color for the laundry room, that would be lovely). I’d love to get everything out and wallpaper it, add some rods, paint its cabinet turquoise, about the color of your background here, but honestly, how will I ever do that when I always NEED to USE the washer and dryer? 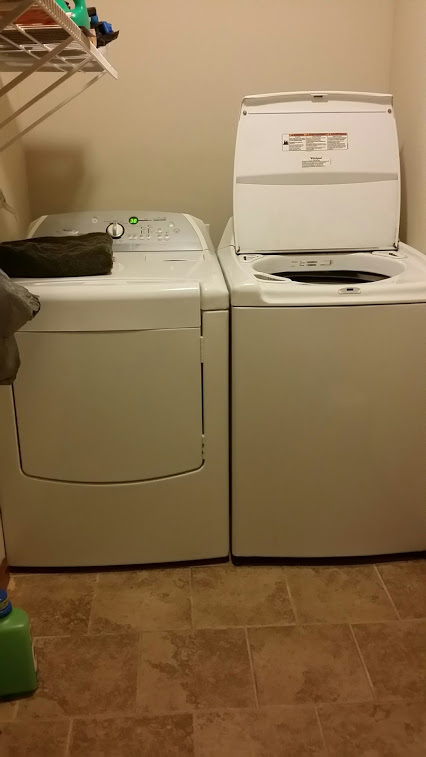 My furnace and water heater are in there, which drives me a bit mad, but my washer was on the right in our last house and it never bothered me. I don’t think I even thought about it before your post. Hmm.